IRISH COAST GUARD search-and-rescue service helicopter pilots are set to take industrial action from midday on Thursday. The pilots are taking action as a result of a dispute on rostering issues. But what does this industrial action actually entail and how has this dispute reached this point? Firstly, the Irish Coast Guard search-and-rescue service is operated under contract company CHC. 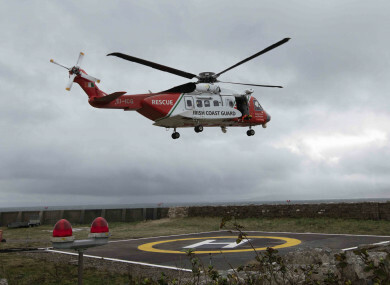 CHC operates five aircraft in Ireland as part of the Irish search and rescue service. There are four aircraft based across four bases, and one is a back-up aircraft. Last week, the Irish Airline Pilots’ Association (Ialpa), a branch of the trade union Fórsa, issued a notice of industrial action to CHC. This happened after a ballot of Ialpa members at CHC overwhelmingly supported industrial action. Fórsa official Brendan O’Hanlon said the union met with CHC management on Monday but no progress had been made on the rostering issue. So, what are the roster issues? O’Hanlon said roster issues have been an “ongoing problem for 18 months”, and that the service is “over-reliant on overtime”. “The service is over-reliant on overtime in order to maintain the required level of service, and has survived for a prolonged period on the goodwill and tolerance of the pilots themselves,” he said. What will the industrial action entail? This means they will work a fixed pattern roster of six days of work (containing three 24-hour shifts) followed by three calendar days free of all duties and obligations to CHC. “The fixed pattern roster will continue indefinitely until CHC management and Ialpa agree a resolution on the issue,” O’Hanlon said. In a statement, the CHC said it “employs the full complement of pilots to operate the aircraft as part of the Irish SAR service. A full complement consists of 37 pilots and currently there are 37 pilots employed”. Well, in short, the industrial action looks set to continue until an agreement is reached. O’Hanlon said Ialpa had sought a mandate for industrial action up to and including strike action if management continues to breach existing collective agreements, including the current PSA, and if CHC failed to implement the current agreed fixed pattern roster and annual level agreement. “We expect pilots to be able to work their agreed rosters to management to ensure the rostering situation is sustainable,” O’Hanlon said. A spokesperson for the Department of Transport said it “would not be appropriate or helpful for the Department to comment at this moment, as it is an internal IR dispute within CHCI DAC”. “The Department is aware that there is ongoing engagement on the matter,” the spokesperson said. The Coast Guard and the Department are monitoring the issue as it evolves, they said. Both parties met again yesterday afternoon and are due to meet again today. The scheduled action is still set to go ahead, but Fórsa has said both parties are continuing to engaging in order to try and find a solution. Email “Explainer: Why are Irish Coast Guard search-and-rescue helicopter pilots taking industrial action? ”. Feedback on “Explainer: Why are Irish Coast Guard search-and-rescue helicopter pilots taking industrial action? ”.